Zonda Disc Brake is a benchmark for all mid-range aluminium Disc Brake wheels. A completely redesigned structure specific to bicycles with disc brakes. The result is all-round improved reactivity, especially thanks to the asymmetrical rims and Mega G3 hubs on both wheels. This innovative solution provides a stable front wheel that is able to absorb energy from the braking torque generated on the left-hand side and a rear wheel that guarantees maximum power transfer from the cyclist. Compatible with HH12, QR and 135 and 142 rear hubs. 6 screws and AFS to ensure full compatibility with every disc available on the market. The front wheel also features G3 technology for top performance even during very powerful braking. Excellent stiffness and reactivity thanks to the G3 system, the milled rim and the innovative RDB balancing system. The Zonda DB wheel is entirely hand-assembled by a specialised Campagnolo® technician and is checked in every tiny detail with electronic instrumentation. This ensures maximum performance and reliability for all Campagnolo® wheels. 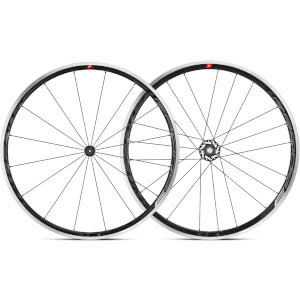 I have the rim brake version of these same Campagnolo Zonda wheels on my summer carbon bike and love those, so when I saw a disc brake version, I jumped on a set of these for my winter/gravel bike. They perform beautifully and offer stellar performance for the price! The hubs are smooth and spin up fast and are very quiet as well (which is what I prefer). My 32mm tires mounted easily by hand on these wheels, and not needing any rim tape is another advantage. I'm a huge fan of Campagnolo and Probikekit. Shipping was fast to the USA and the price was amazing! You can't go wrong with these if you're on a budget!